The August 2011 Daring Bakers’ Challenge was hosted by Lisa of Parsley, Sage, Desserts and Line Drive and Mandy of What the Fruitcake?! These two sugar mavens challenged us to make sinfully delicious candies! This was a special challenge for the Daring Bakers because the good folks at http://www.chocoley.com offered an amazing prize for the winner of the most creative and delicious candy! If you simply melt chocolate and let it cool it will set with unattractive grey streaks or spots, called blooming. If eaten, the texture will be grainy and it won’t melt smoothly in the mouth. When you temper chocolate the end result is shiny, even colored, smooth melting and with a crisp snap. Basically, tempered chocolate is what you want because it’s better in every way. Simply put, the process involves heating the chocolate to a certain temperature, then cooling it down to a certain temperature, and then heating it back up to a working temperature that is lower than the initial temperature to which it was initially heated up. The reason for the difference is a bit complicated, it has to do with different types of crystals forming in the cocoa butter at different times, to understand it fully you’d have to learn about the behavior of the chocolate crystals at a molecular level. To simplify the explanation, in tempered chocolate the crystals have formed in a uniform way which gives us great looking and tasting chocolate. Our challenge was to make two different types of candies, with at least one being chocolate. For the first candy, I decided to make chocolates that involved the flavors of one of my favorite desserts - Bananas Foster! I caramelized some bananas in brown sugar and rum, then pureed them and mixed them into a swiss meringue buttercream to create a bananas foster buttercream. I then filled my white chocolate candies with this buttercream, and added in a layer of salted caramel. 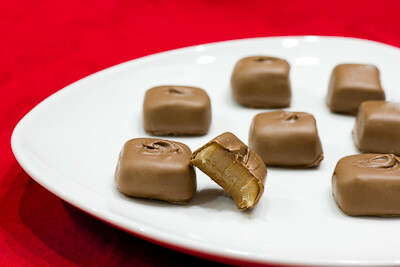 These Bananas Foster Chocolates were delicious! I used the marble slab/granite method for tempering my chocolate and although it is a fairly straightforward process, I have to admit that I had to stop, let my chocolate set, and start over multiple times because my chocolate would quickly get over the working temperature. One second it would be way under the temperature I was shooting for and then next thing I knew, it was rising so quickly I would over heat the chocolate. I think this may have had something to do with the fact that I was using a glass bowl for my double boiler, and the glass would retain so much heat that even after I removed the bowl from the heat, the chocolate's temperature would continue to rise dramatically. If you work quickly, you can dump the chocolate onto the counter before it over heats, but it's hard when you're working with a very hot bowl, a thermometer, and a spatula all at the same time. So instead of glass, I would probably recommend using a metal bowl. I don't have a palette knife or bench scraper, but found that using a rigid spatula worked just fine. It was a little messy, but a suitable substitute if you're not wanting to go out and buy something just for this recipe. Funny thing was that when I first poured my chocolate onto the counter and started spreading it out and folding it to get it to cool down, I was very careful because the recipe states "keep the motions neat and tidy, if you’re not working with a lot of chocolate you don’t want to spread it too far otherwise you may end up with chocolate that begins to cool too quickly and start to set as well as drops below." I was also glad to have my digital thermometer , because it's a multi-tasker in the kitchen! I did not realize until we did this challenge, but you cannot use a regular candy thermometer for tempering chocolate because candy thermometers do not go below 100F. So this digital thermometer is perfect because it goes low enough for making chocolate, high enough for making candy, and of course it can be used for cooking meat as well. It has a heat safe cord so it can be left in the oven while the meat is cooking, too. It has been well worth the investment! 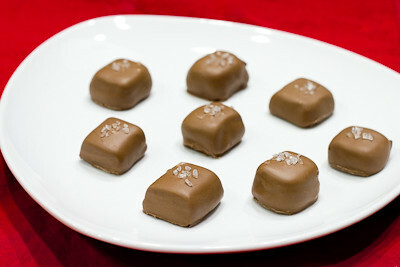 The second candy I decided to make was chocolate covered sea salt caramels. I adore anything with caramel, so it just made sense to go with that choice. I have to admit that while my white chocolate candies turned out pretty well, my chocolate covered caramels didn't turn out quite as well as I had hoped. The chocolates didn't have as much shine to them as they should have, but that was my fault because after redoing the tempering about 5 times, I just gave up and said "close enough" when it was off by 1 degree because I was too tired to redo it again. 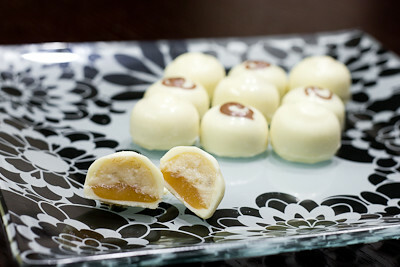 My caramel, while still soft, also came up much firmer that what was depicted in some photos by our hosts. Instead a nice gooey, drizzle-over-the-top-of-your-ice-cream-sundae caramel, I got a firm, chewy caramel. At first I thought it was because I let the caramel get 2-3 degrees hotter than I was supposed to, but then I made a second batch, keeping close watch on the thermometer, and it still came out fairly firm. This was fine, because then instead of making filled chocolate candies, I simply made chocolate covered caramels by dipping them in the tempered chocolate. These were delicious, with just the right amount of salt to complement the sweetness of the caramels. Thanks Lisa and Mandy, for hosting this month's challenge. I had a great time learning how to temper chocolate and making homemade candies! There's a lot of scrolling to do on this post to get to the recipes due to the lengthy information below on how to temper chocolate, so to jump down to the white chocolate bananas foster candies recipe just click here, and for the chocolate covered sea salt caramels click here. Make sure you check out the Daring Bakers' Blogroll to see how creative everyone else got with their chocolately confections! - When tempering chocolate use a metal bowl instead of a glass bowl. If you want to help keep it at the working temperature during the final stage, then you can transfer it to a glass bowl which will retain the heat better so you don't have to keep re-warming it so much. - When you are getting close to your goal temperature, really do stick to heating it for 10-15 seconds at a time. This ensures that you don't over heat the chocolate and have to start over so many times like I did! - If you have trouble getting your chocolate down to 80.6F, you can cool down your counter/marble slab with an ice pack (or bag of frozen veggies) beforehand, just be sure to wipe it down very thoroughly before pouring your chocolate onto it, because any water droplets left on there will cause the chocolate to seize. 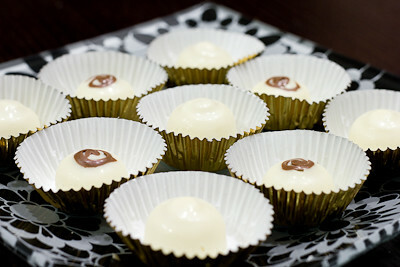 - I added milk chocolate swirls on top of my white chocolate candies for contrast, but found that it is better to add the milk chocolate swirl on top after unmolding the finished chocolates (as opposed to piping the swirl into the mold and letting it set before adding in the white chocolate). Chocolate is melted and heated until it reaches 45°C / 113°F. It is then poured onto a marble surface and moved around the surface with a scraper until it has thickened and cools to 27°C / 80.6°F. Once cooled it is then put back into the bowl and over heat to bring it back up to 32°C/30°C/29°C /// 89.6°F/86°F/84.2°F depending on the chocolate you’re tempering. It is now ready for using in molds, dipping and coating. •	Finely chop chocolate if in bar/slab form. •	Place chocolate in a heatproof bowl. •	Place bowl over a saucepan of simmering water (make sure the bowl does not touch the water). may fall into your chocolate. If water gets into your chocolate it will seize! Tip: If you’re using the chocolate to dip a lot of truffles etc. which means the chocolate will be sitting off heat for a while it will naturally start to thicken as it cools. To keep it at an ideal viscosity for even coating, put the bowl over steam for 30sec-1min every 5-10mins, just do not let the temperature go over the working temperature! Chocolate is melted and heated until it reaches 45°C / 113°F. Tempered un-melted chocolate is then stirred and melted in until it brings the temperature down to 27°C/80.6°F. It is then put back over heat and brought up to its working temperature of 32°C/30°C/29°C /// 89.6°F/86°F/84.2°F depending on the chocolate you’re using. It is now ready for using in molds, dipping and coating. •	Finely chop chocolate if in bar/slab form (about the size of almonds). •	If you still have a few un-melted bits of chocolate, put the bowl back over the simmering water, stirring gently and watching the thermometer constantly. Tip: Another way of adding the "seed" is by dropping in one large chunk of tempered chocolate (the seed). That way you only need to fish out one piece of unmelted chocolate and don't need to fish out several small bits of unmelted chocolate once the chocolate has reached temper. •	If you’re using the chocolate to dip a lot of truffles etc. which means the chocolate will be sitting off heat for a while it will naturally start to thicken as it cools. To keep it at an ideal viscosity for even coating, put the bowl over steam for 30sec - 1min every 10 - 15mins, just do not let the temperature go over the working temperature! •	Remember, don’t let any water get into your chocolate at any stage of the tempering process! •	Unless you’ve been working with chocolate for a while and have developed a feel for the tempering process and can tell the chocolate’s temperature by touching it to your lower lip like a pro, it’s imperative that you use a thermometer to determine the temperature, as going a few degrees either way can ruin the temper. •	If at any stage you do make a mistake with the tempering process you can simply start again from the beginning. •	Any chocolate left over after making your molded or dipped chocolate can be stored away in a cool place and then re-tempered before using again. There’s no need to ever waste good chocolate! Place the sugar, corn syrup and water in a medium saucepan. Set over medium-high heat and stir to combine. Bring the mixture to a boil and cook until dark amber in color 310°F-315°F / 155°C-158°C, about 5 minutes. Use a pastry brush, dipped in water, to wash down sides of pan to prevent crystallization as the mixture boils. Remove saucepan from the heat and gradually whisk in the passion fruit puree, heavy cream and butter. Transfer to an 8-inch square pan that has been lined with buttered aluminum foil. Once cooled, removed the aluminum foil from the pan and cut the chocolates with a sharp knife (coated in butter) into 1-inch squares. Coat the molds with chocolate; there are a few ways to do this. While holding mold over bowl of tempered chocolate, take a nice ladle of the chocolate and pour over the mold, making sure it cover and fills every well. Knock the mold a few times against a flat surface to get rid of air bubbles, then turn the mold upside down over the bowl of chocolate, and knock out the excess chocolate. Turn right side up and drag a bench or plastic scraper across so all the chocolate in between the wells is scraped off cleanly, leaving you with only chocolate filled wells. Put in the fridge to set, about 5 to 10 minutes. Alternatively, you could take a small brush and paint the tempered chocolate into each mold, or spoon it in if you’d like. Remove from refrigerator and fill each well with some of the bananas foster buttercream, leaving a little room for a layer of caramel. Squeeze a thin layer of caramel on top of the buttercream (make sure the caramel is cool, or else it will melt the buttercream). Again take a ladle of chocolate and pour it on top of the filled chocolate wells, knocking against a flat surface to settle it in. Scrape excess chocolate off the mold with the bench scraper then refrigerate until set. Once fully set, carefully knock the chocolates out of the mold. Put the sugar and egg white in a mixer bowl or another large heatproof bowl, fit the bowl over a plan of simmering water and whisk constantly, keeping the mixture over the heat, until it feels hot to the touch, about 3 minutes. The sugar should be dissolved, and the mixture will look like shiny marshmallow cream. Remove the bowl from the heat. Switch to the paddle attachment if you have one, and add the butter one tablespoon at a time, beating until smooth. Once all the butter is in, beat in the buttercream on medium-high speed until it is thick and very smooth, 6-10 minutes (during this time the buttercream may curdle or separate – just keep beating and it will come together again). On medium speed, gradually beat in the bananas foster, waiting until each addition is absorbed before adding more, and then add in the rum. You should have a shiny smooth, velvety buttercream. Press a piece of plastic against the surface of the buttercream and set aside briefly. Add the brown sugar and rum to a small saucepan over medium heat until the brown sugar melts. Add the banana slices and cook for a few minutes on each side, until the bananas are soft and cooked through. Remove from heat and mash well with a fork, or puree in a food processor. Allow to cool completely before adding to the buttercream recipe. Remove saucepan from the heat and gradually whisk in the heavy cream, butter, and sea salt. Transfer to a medium bowl and let cool. Transfer cooled caramel to a pastry bag fitted with a medium plain tip or a squeeze bottle. Oh. My. GOD. If I could eat my way through the computer screen, I would. Those looks AMAZING. Hats off to you! Absolutely stunning and delicious sounding chocolates - fantastic job! 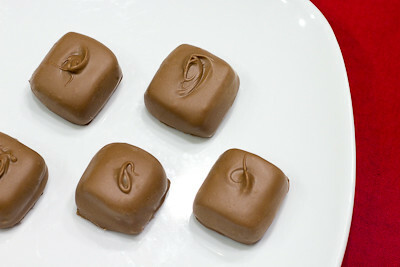 I love the perfect little finishing swirls you got on the top of your caramels! They look great! I'm a chewy caramel fan myself...way to be flexible! Nice creativity - the Bananas Foster candy is over the top. While I wouldn't normally be a fan of banana in a candy, they sound and look too good to pass up. As for the salted caramel coated in chocolate, that's right up my alley. Nice job on this month's challenge. 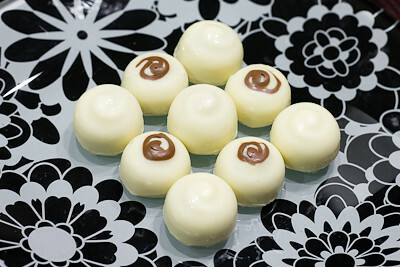 Your bananas foster buttercream chocolates are phenomenal - so much so, it was in the running for one of the prizes! It was sooo hard to narrow them down! I wish I could send you a prize for those! Beautifully done - great write-up about your tempering - you did a fantastic job!